By Shelley Webb, Senior Products Contributing Editor in Consumer Affairs. People who have trouble navigating stairs due to injury or disability, including those who can no longer walk at all, may be able to take advantage of stairlifts. 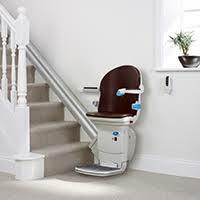 Stairlifts allow users to sit comfortably in a seat that takes them up the steps using the stairs’ railing as a track. Stair lifts allow people to stay in their homes when they might otherwise need to move. Consumers can choose from lifts with a variety of features to help them retain their mobility and independence.